Sequencing a tumor’s RNA in addition to its DNA makes it possible to better characterize the cancer’s mutations, reported Neil Hayes, MD, MPH, at the American Association for Cancer Research’s annual meeting. This additional information, said Hayes, may help improve a cancer patient’s treatment. 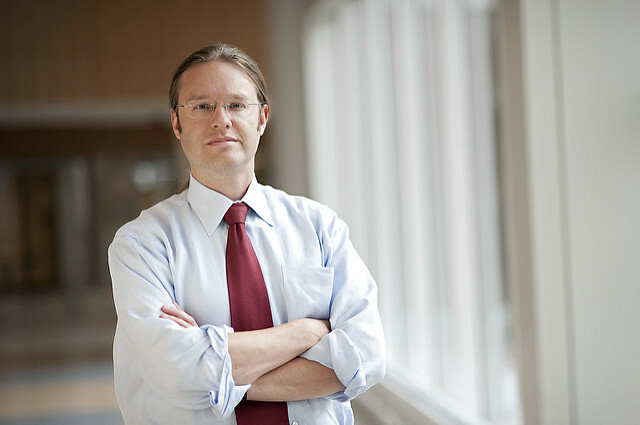 Neil Hayes, MD, MPH, is a UNC Lineberger member and an associate professor in the UNC School of Medicine Division of Hematology/Oncology. After an earlier study determined that genetic sequencing of a patient’s tumor could improve care by matching the mutations and genetic abnormalities with targeted treatments, University of North Carolina Lineberger Comprehensive Cancer Center researchers are now studying whether RNA sequencing, in addition to DNA sequencing, can improve patient care further. Their preliminary findings will be presented at the American Association for Cancer Research Annual Meeting 2016, today from 8 a.m. to noon CST. In the study, researchers selected a subset of 300 patients for RNA sequencing from a group of 2,200 patients who had been consented as part of a clinical trial for sequencing. The new research looks to build on the findings from the UNCseq program, which was launched in 2011. In the preliminary study findings, researchers report they identified changes in RNA based on DNA mutations, and the additional information could be potentially helpful for better management of cancer patients. Hayes said the use of RNA also could be used to generate gene signatures at the same time they are detecting mutations, providing additional information that could have “broad potential use” for many cancer patients.